Lismore is an island of some 2,351 hectares (10 miles long and 1 mile wide) off the west coast of Scotland, in the Inner Hebrides. It is the most easterly island of the Southern Hebrides. It lies in Loch Linnhe, north east of Mull, the second largest island of the Inner Hebrides after Skye, in the Argyll and Bute council area. Click the next link to see Lismore shown on Google maps. How do I get to Lismore? Two ferry services operate to the Isle of Lismore from Oban or from Port Appin, both of which are on the main land in Argyll. The Oban ferry to Lismore takes 60 minutes. Vehicle reservations are recommended. Visit the ferry operator’s website for more information, times and prices: CalMac. It takes 2 hours 30 minutes to drive to Oban from Glasgow, 3 hours from Edinburgh, 4 hours from Aberdeen, and 2 hours 45 minutes from Inverness. The Port Appin ferry to Lismore takes 10 minutes and is a passenger only ferry. No vehicles. Visit the ferry operator’s website for more information, times and prices: CalMac. Where are Mairi's retreats held on Lismore? 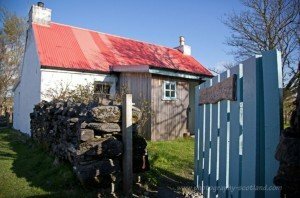 Mairi’s music retreats on Lismore are held at Carnie cottage, which is in the centre of the island, 4 miles from the Port Appin ferry landing (Point) and 2 miles from the Oban boat landing (Achnachroish). Carnie is a traditional Highland cottage with an extension that serves as the kitchen. The cottage is warm, welcoming and we sleep there too. Classes take place in the Studio, a purpose-built space of 9m by 5.5m, with an oak floor, good light and good insulation, which is situated in the back garden of Carnie. How do I get to the retreat venue from the ferry? You could take a taxi from the ferry to Carnie Cottage. Dorothy or John Livingstone are the island’s taxi drivers and you’ll need to book them in advance, by at least a day or two, by calling 01631 760 220. A taxi to the cottage costs £11 and the car can take up to 4 passengers. And if you don’t manage to book a taxi then don’t worry… islanders are very friendly and will give you a ride if they’re passing. When you get to the cottage, there will be a hot cup of tea waiting for you. Where do I stay on a Lismore retreat? The course fee does not include accommodation or breakfasts or some evening meals. The fee does include tuition plus lunches and the evening meal on the day of arrival. The best and cheapest accommodation is the Lismore Bunkhouse, which is £20 per night per person if you’re in the dorm room. Or there’s a single room at the Bunkhouse. There are lots of places to stay on Lismore. Airbnb might be good if you want more space/privacy, but the Bunkhouse is a 5 minute walk away from the studio and cottage where we do all the classes. The cottages below are self-catering and are also within walking distance of Carnie cottage. What 'level' are Mairi's retreats and workshops for? All of Mairi’s courses are suitable for people of all musical abilities. Mairi’s music retreats support your playing wherever you are. They offer a chance to expand and explore your own playing, and have fun playing with others in clear and incremental frameworks. Mairi cover the areas that you’d like to address: technical support for violin and voice; extending repertoire; finding harmonies; blending with others and playing solo; nerves and anxiety around performance… and much more. Mairi will work with the material that you bring, helping you to create soundscapes using tunes, songs, poetry, movement and story. Willingness is the only requirement – no particular level of playing required. What types of retreat are there? Exploring harmonies, technical support for bowing, tone, tuning and style. From beginner to professional player – all levels accommodated. Great food, beautiful place, new friends and a fabulous kitchen ceilidh! Mairi’s voice retreats aim to create a supportive environment and opportunity to meet others in music and discover your voice. Mairi introduces songs and leads fun group improvisations, allowing each participant to experience resonance and community through singing. Maximum 7 participants. What are the timings for the retreat? You can arrive at Carnie cottage anytime from 3pm on the first day. 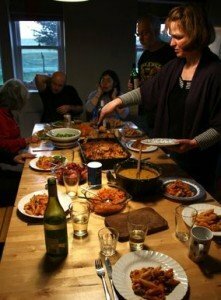 We’ll eat dinner at 7pm on the first night, followed by a session facilitated by Mairi. Each day, we work for four hours: from 9am to 11am, followed by brunch, then from 11.45am to 2pm. Then there’s free time to relax and visit the island. The studio is available for use at this time too. In the evening, we gather around 7pm for an evening meal. Participants find this setup works well and gives a good balance between music and group work, and having time to yourself to relax and explore the island. On the Saturday night, we will have a ceilidh, which is an informal get-together with local friends and family who like to play music and meet new faces. We finish in time to get the 3pm ferry on the Monday (or the 4pm boat on the course that ends on the Sunday). Mairi suggests you bring some sort of recording device. Smartphones are good and there are many reasonable recording device options on the market. If you have the sheet music for your song or tune, please bring it. It’s not essential though. There is a photocopier in the cottage. What food do we eat on retreat? All meals are vegetarian. Please contact Mairi if you have any dietary requirements or allergies. Mairi brings the food and likes to cook the Friday evening meal and prepare the food for the course. All help towards cleaning, washing up and making salads is gratefully received. Mairi recommends that you bring snacks to share at breaks and that you make a beeline for the kitchen as soon as you arrive at Carnie cottage. Is there a shop on Lismore? The shop is about 5 minutes walk away from Carnie cottage. It sells pretty much anything you’d want and also has free internet access. Opening times: Friday 9am – 5pm; Saturday 9 -1pm; Sunday closed. What is the difference between one of Mairi's retreats and a workshop? Mairi’s music retreats tend to take place on the isle of Lismore over the course of at least 2 or 3 days, sometimes longer. There tends to be a maximum of 7 participants per retreat course. Mairi’s other workshops tend to be in locations around Scotland, and further afield. Some last a few days and are in the retreat style, such as those Mairi co-leads with Kath Burlinson or Kedar Brown, and other workshops are for just a few hours and do not tend to have a maximum number of participants. Both retreats and workshops are suitable for people of all musical abilities. Everyone is welcome. How do I book my place on retreat? The retreat price includes accommodation and meals. Spaces tend to be limited to a maximum of 7 participants – so do secure your place in advance by visiting Mairi’s shop.